Bicycling Reno to Salt Lake City, via US 50, "the Loneliest Road"
A ride across Nevada and then to Salt Lake City via US 50, approximately 650 miles with 30,000 feet of climbing. Multiple small mountain ranges and wide open valleys to cross as the mountains go north/south in Nevada. It is a beautiful and peaceful ride with normal summer temperatures in upper 80s or lower 90s, so warm but nothing like the deserts further south. Longest gap between services/water is about 85 miles. John Leo and I planned this ride for fourth of July week as an extension of a ride we did to Reno, three years before. John was going to start in Palo Alto three days before and we'd meet up in Carson City. Unfortunately as described on his web site, those days were too much and I ended up riding solo. I would recommend this ride to a cycle tourist with more than beginner touring experience. The remainder of this web page contain some of my journal entries from the trip as well as photos. Nice to be cycle touring again. 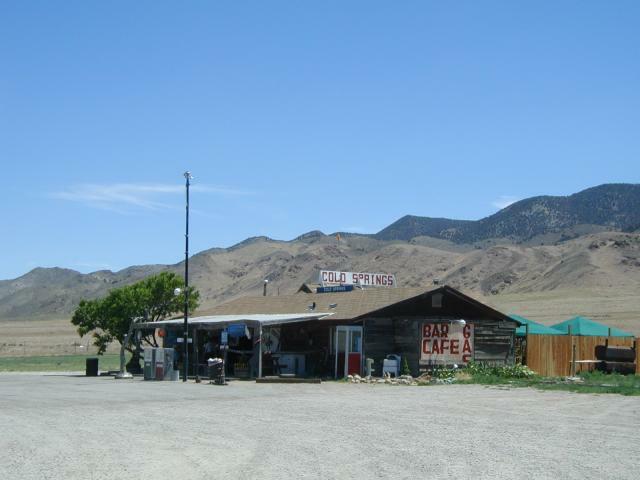 The trip from Reno to Salt Lake City is somewhat of an extension from a ride John Leo and I did in 1999 from Bay Area to Reno. 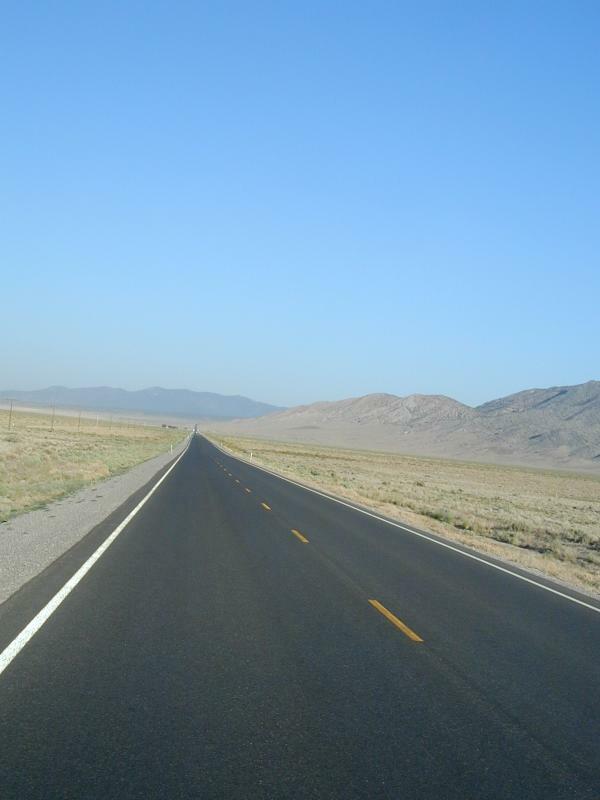 Plan is to ride US 50, nicknamed "The Loneliest Road" through Nevada. The route is ~650 miles with about 30,000 feet of accumulated climb (mountain ranges in Nevada go North/South, so across the grain). Temperatures have been in the mid and upper 90s. I'm a little concerned about the dry heat, particularly on what I expect to be the toughest stretch from Fallon to Austin, 110 miles and 4700ft of climb. There are limited services throughout, but this will be a motel trip. However, my notion of "limited services" has changed since riding outback Australia. I've found that the earlier I pack prior to a trip, the more I bring as I hestitate of maybe I should bring... I packed the night before, so my bicycle + gear weighed in just over 70 pounds at the airport. When fully loaded, there will be another 25 pounds of water (12 liters). Uneventful flight to Reno. I could see smoke from one of the fires (Glenwood Springs?) as we flew past. It took a while for baggage, but by noon I was on the road again, yeah! 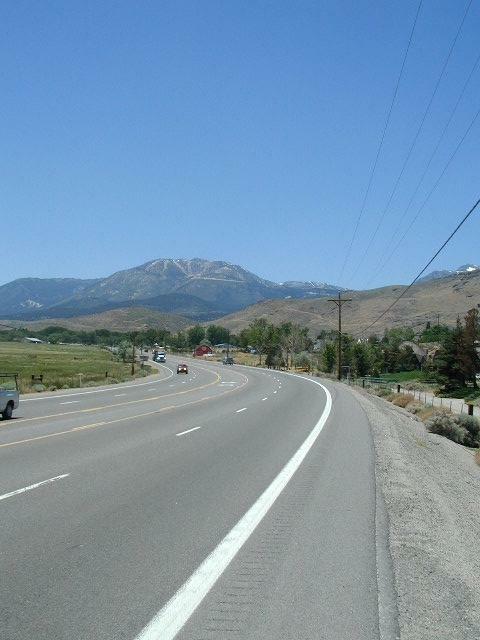 Reno to Carson City is 30 miles, mostly along highway 395. 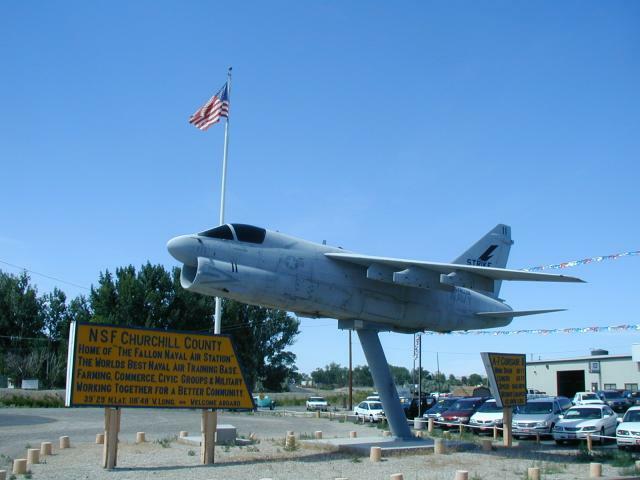 The first several miles, hwy 395 was a restricted access road, so on the business route instead. It was warm but mostly ok, except whenever I stopped for a light. No breeze and hot pavement. Reno had quite a bit of strip development before going over a slight grade and to Peaceful Valley, the next valley over. From here a moderate climb to 5089 ft (Reno is 4500ft) and the next valley over was Wahoe Valley with a large lake. 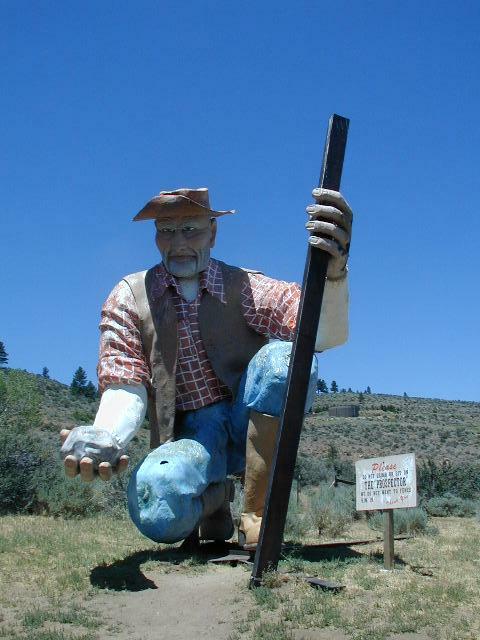 Here I found "Chocolate Nugget" a chocolate store that sold ice cream bars and also the prospector pictured above left. Good excuse for a break. After crossing the wide Washoe Valley, up over the hill at 5132 ft and then down into Carson City. Nice easy first day ride. John wasn't in yet, so waiting at motel for while as he called from Woodsville. Unfortunately looks like we won't meet up for this trip. The Sierras tougher than we thought. Hopefully not an omen for my trip. I'm at least encouraged by forecasts of light tailwinds for the next few days. Today an easy ride to Fallon. A few slight climbs, but more downhill than up and occasional light tailwinds. I'm riding through downtown Carson City right about sunrise. Garish neon from Casinos still brightly lit. Heading east from town three or four pawn shops, a tattoo parlor, a few shopping plazas and a variety of roadside business. 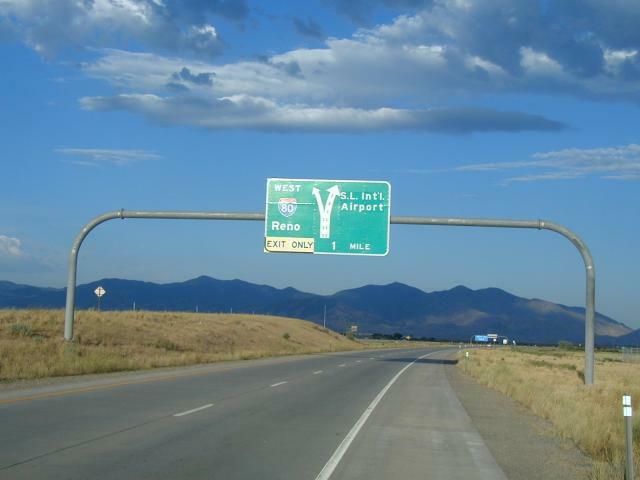 The route climbs a bit and near the summit I'm in Lyon County. On the way is a sign for the Pony Express, 1861-1862. Despite all the lore, interesting Pony Express only lasted about a year and a half. A nice descent towards the river and I pass through hamlet of Dayton. The next 30 miles a fairly level. There are quite a few recent housing lots sold here, either in 5 acre plots or more tightly clustered in subdivisions. Prices say, $120,000 and higher. Nevada is one of the fastest growing states and I get the sense this is the sort of area that has boomed with retirees taking advantage of lack of income tax in Nevada. Not much in way of other businesses other than occasional gas station as I pass through Dayton, Stagecoach and in to Silver Springs. I see quite a few sports cars pass, but nobody I ask knows where they are headed. I've also been asking about services available between Fallon and Austin, but standard answer is "I've only been there once or twice". From here folks go to Fallon, Reno or Carson City instead. At Silver Springs is intersection with Alt 95, another gas station and chance for a break. No answers here either about sports cars or hwy 50. At this point the road narrows and unfortunately almost all the one foot paved shoulder is taken by a rumble strip, so I'm riding further left. A slight hill and then past Lake Lahontan. This reservoir is part of water supply for Fallon and related areas. Canals from the Truckee river are also used. This is part of the "Great Basin", meaning the water doesn't drain to the sea. Instead to narrow wetlands area (Stillwater east of Fallon). The amount flowing to the wetlands is only about a quarter of what it was 100 years ago due to irrigation. Many many years before that this entire Great Basin area was an even larger lake. Not long after the lake, the road hooks up with Alt 50 and more traffic. Farming areas before coming into the strip mall outskirts of Fallon, population 8000 or so. It is before 11 am when I find the visitor info literature at the convention center and talk briefly with someone hosting a water conference there. Rainfall in the Sierras is ~100% this year and rainfall in Fallon averages 4" per year. Find a motel, walk to Safeway and otherwise have a relaxing afternoon after 64 miles this morning. The finish wasn't elegant, but I made it to Austin after 12 hours travel from Fallon. I hope this is the toughest day on this trip since I'm not certain I could go much further. The ride started in pre-sunrise coolness. Crossed over Maine (with an "e") Street and I was heading outbound from civilization. First several miles had many irrigated cool fields. 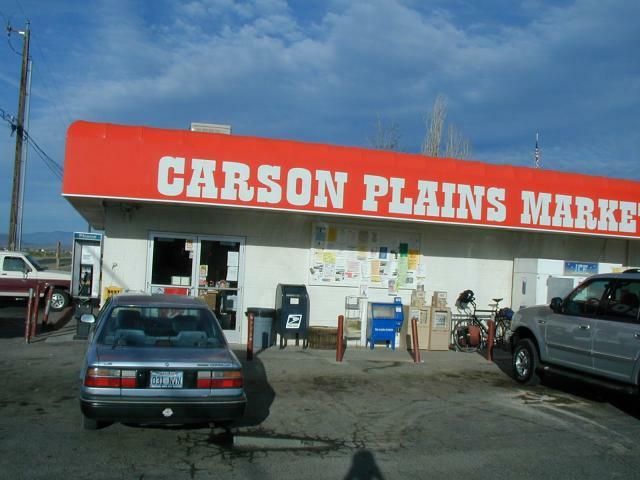 At five miles was a turn in the road and brief stop at a convenience store. According to locals, US 50 has about half a dozen touring cyclists per week, so popular route from San Francisco to the east coast. Fairly flat as I reached edges of irrigated region and vegetation was replaced with sagebrush and playa lakes. Flat terrain and cool temperatures made for quick travel as I rode to Sand Mountain. This is a 600 foot high sand dune and attraction for many 4 wheelers. Also here was the "Loneliest Phone". At Sand Mountain started the first of seven climbs today, this one only to 4600 ft, but still steep enough to slow me down. From the summit a brief descent before another climb up Grumm Pass. Another descent and then climb to Middlegate at 47 miles. 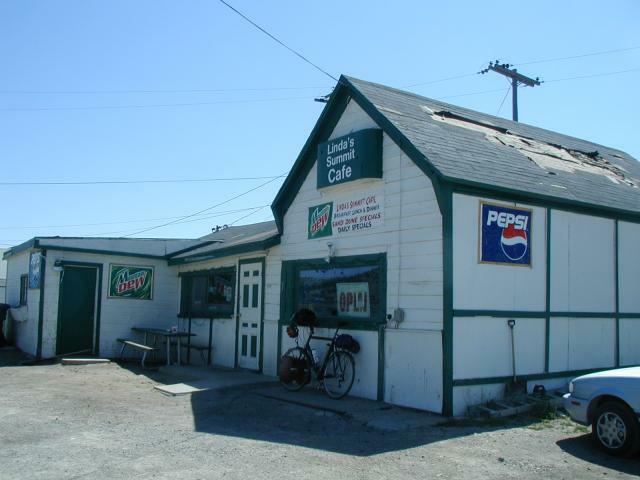 Middlegate had bar, gas station, cafe and motel. If I'd known this, I could have stayed, though only 9:30am. I paid entirely in nickels... The motel yesterday had a casino so they gave coupons for nickels. I think the idea is you were supposed to feed the slot machines, but I'd rather have my money back even in nickels. 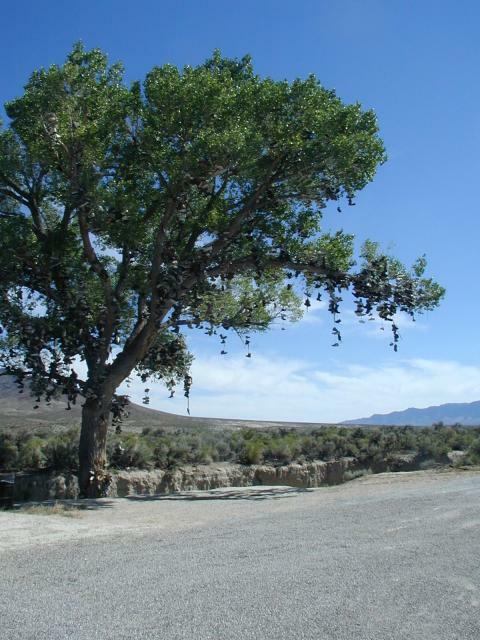 At 50 miles was the shoe tree. A large tree with hundreds of shoes in the branches. Legend is a couple was stopped there, got into a fight so the woman threw the man's shoes into the tree and drove off. Things went from there. After the shoe tree another long slow climb and at Cold Springs for lunch at mile 61. Friendly folks here and a relaxing break. After lunch started well with tailwind and downhill as I slowly made my way around to New Pass. Another slow slog and I was at top at 87 miles. By now, I was getting tired and walked brief stretches. From New Pass a descent and another four mile climb to Mount Airy Summit at 93 miles. Mount Airy was over 6500ft and there was a long descent to the Reese River Valley around 5500ft and a climb back up into Austin. Austin is on the side of a hill where the road summits at 7500ft. The town itself is 6589ft and somewhat steep coming into town. I walked. I was tired, it was steep. Not elegant, but last two miles or so mostly walking uphill. I was happy to see the motel in town as I arrived at 5pm. Not much in way of groceries, but a shower and a steak dinner helped rejuvinate things. Overall 110 miles and 4700ft of climb today. Tomorrow starts with an even steeper climb (walk?) to Austin Summit. If Montana didn't have the slogan, "Big Sky Country", Nevada would have fair claim to the same. Huge wide open valleys with low sagebrush makes for long views and interesting cycling as I slowly make myself across the valleys before climbing over the next range of mountains. I crossed two ranges today with three passes. I didn't want to wait until 6am for the restaurant to open, so was on the road by 4:45am. The first three miles was marked as 7% grade as I slowly walked and rode up to top of Austin Summit at 7484ft. Took nearly an hour to get to the top. Here a brisk descent and another climb to 7264ft at Bob Scott Summit. Nice and cool. With less than 10% humidity, the difference between high and low temperatures is almost 40 degrees (95 and 55). A nice fun descent marked at 6% between miles 7 and 11 and then across the wide Smokey Valley. Sign said, "Loneliest Golf Course" was 50 miles south, but decided to skip it. I saw an antelope, jackrabbit, many lizards and a flat snake. Supposedly there are wild horses here, but I didn't see any. At 24 miles was Hickinson Summit at 6546ft, my third pass for the day all in the first third of the ride. Near the top were signs for petroglyphs. Not much descent before heading across the wide Antelope Valley. It was slowly warming up, but also flatter so made good time. At 37 miles were picnic tables and brief stop. At 60 miles lots of grasshoppers all over the road and then road ducked between bluffs. After this the road turned into a hot SW wind and slowly climbed. Made it a bit tougher, but still was in Eureka at noon after 70 miles. Temperature is currently 93, so happy to be beating the heat. High temperature reached 97 in Eureka with more hot forecast for tomorrow. Normal highs for the day is 83. 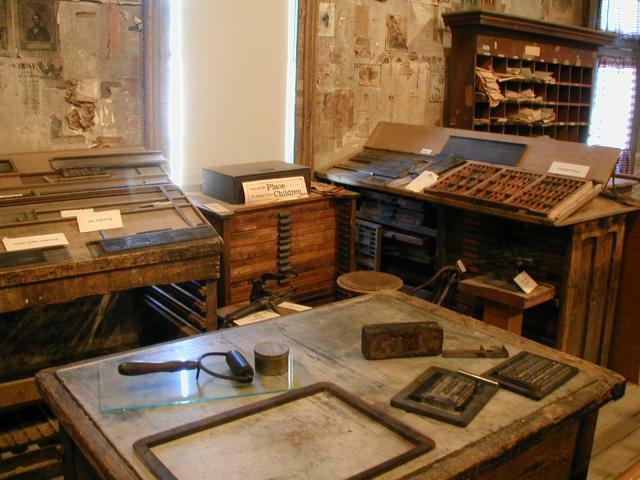 Nice museum in town, situated in former newspaper building. Met my first touring cyclist, Mike, heading from East Coast to San Francisco. Nice to get info about the road ahead (some long climbs, with four summits tomorrow). A challenging ride today with four summits. The last two were both the longest and the warmest. Hard to compare, but felt pretty good with ride today. Once again an early start. Left Eureka at 4:30am while it was still cool and just starting to get light. A gradual climb of five miles and 900ft brought me to Pinto Summit at 7350ft with sunlight still sheltered by the mountain ridge. One (easy) climb done. A nice fun 6% grade and fast descent back to a sagebrush valley. These mountains are otherwise pinon pine. The road kept descending and finally bottomed out at about 15 miles. Saw a few antelope, crossed the valley bottom and soon started climbing again. It was 7am, and 23 miles when I crested Pancake summit at 6517ft. Two (easy) passes done. Still nice and cool. There wasn't much flat today as the road descended for a few miles, crossed a valley and started a nine mile long ascent up the next hill. Bright sun, no clouds and starting to get warm. Last two miles wound through canyons at 6% grade. Reached Little Antelope Summit at 36 miles, 7433ft at 9am. I had started with three chocolate bars and ate the third one on the third summit just as the chocolate was starting to melt. Three passes and starting to get hot. Another fun descent, along and through some canyons as the road just kept going down and down. Jakes Valley was broad sagebrush valley to cross before starting another nine mile climb. I walked a few parts just to exercise other muscles, but overall was still feeling strong despite the heat and hill. It was slow but I crested Robinson Summit at 7539ft a little before noon. Yeah! Four summits and four climbs. A nice descent, but occasional headwinds as came downhill, past the huge Ruth copper mines and into Ely a little before one pm. 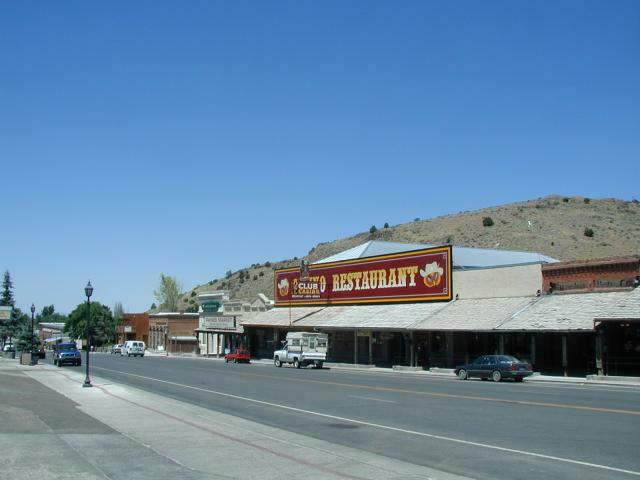 Ely is a larger town (population 5000 - largest since Fallon), with nice old downtown and better selection of motels and restaurants. Nice to be here relaxing particularly as it is 95 degrees and keeps getting warmer. Feel fairly strong at having ridden the hills today. 77 miles today. Tomorrow forecast is only for 90 degrees. Apparently, this highway was first dubbed "The Loneliest Road" by life magazine (1964? 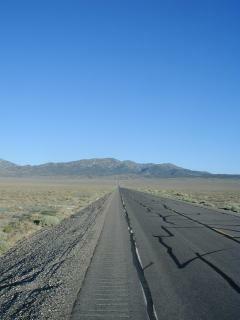 ), in describing the road from Ely to Fernley. It has been proudly adopted with "passports" you can have stamped from each town. Nice walking downtown through some of the old shops. Also several casinos here. Friendly folks. I'm close to downtown and think there is more of a "strip" on the outskirts. I haven't seen it, but apparently Ely is big enough to have a McDonalds. Big excitement across the street was a gasoline spill. Several firetrucks and otherwise mopping up excess gasoline. 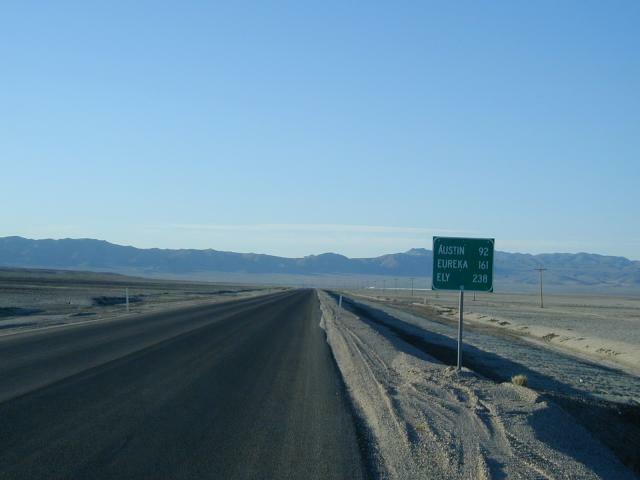 There's a road across Nevada that they all talk about. It's the loneliest, they say, and every mile a drought. They see only sand and sagebrush, a land with no tall trees. And they say if you find trouble, it's a desperate place to be. To see a land of friendship, with memories to share. If they could ride inside my heart for a while, I'd love to take them there. Over there ghost town sleeps, and dreams away the day. Will crowds of eager people ever again pass it's way? Time has passed and left it to be, to gracefully grow old. Thank God for a piece of America that's not been bought - or sold. The voices of those who blazed this trail a century before. Their stories light my memory like the glow of hidden gold. And I can't help but wonder how many stories went untold. As I wonder out through history, stopping now and then. A welcome wave, a helping hand, somewhere along the way. With deep respect for what used to be, they watch over it today. At night the highway glistens, for those who care to see. Hills of silver, stars of gold, light the way for me. Out there in the distance, a vision fills my sight. A fearless rider, with a pouch of mail, flying through the night. Over the mountains, to the West, there's a world where pressure reigns. And a different breed of people compete to share the pain. That's the place where danger lurks, a threat of another kind. Around each corner a stranger waits to steal your peace of mind. And somewhere between Fallon and Ely, I'll find the peace I need. Out there I don't feel threatened, and I'm never quite alone. To me it's not a lonely road; it's heaven's pathway home. Reached the NV/UT border and am staying at the Border Inn. The slot machines are in Nevada, the gas pumps and motel in Utah. Phones are marked Nevada Bell but the clocks are on Mountain time (Utah). A shorter ride today, only 63 miles but still left early. Slightly rolling terrain as I left southwards along a wide open valley. Signs said "elk viewing area". I saw quite a few antlers today, but no elk. Very light headwind, but nothing too bad. Signs pointed to Ward Charcoal Ovens off to the side. At 16 miles the road started to climb, with a steep section near the summit at 21 miles. Also some road construction here, but they were still getting organized and let myself and other traffic through. Later I saw pilot cars leading a procession of vehicles. Connors Pass, 7733ft, my highest point for this trip. Yeah! A nice descent from here as I started down to Spring Valley, the next valley over. Not quite at bottom was Major's Place at 26 miles. Looked like a bar/restaurant RV park but wasn't open yet. Continued down and across Spring Valley and along the other side. Another road construction area here with paving, one lane of traffic and pilot cars. They told me just to go through, and watch out for the trucks. On a few occasions in the next several miles, I got off the road to let traffic pass (from both directions). At 41 miles I came to end of road construction, looped around south again and started heading up Sacramento Pass. It was becoming warm and there was a long grade, so it was a slow ride up. On way up, came across a cyclist who was riding from Virginia Beach to San Francisco. He'd been breaking spokes including one on other side of Sacramento Pass and was now hoping his wheel would make it to Ely and a bicycle shop. A slow slog up Sacramento Pass and then into more of a headwind as I came into Snake Valley (probably not named by real estate agents). The road kept descending bit by bit. 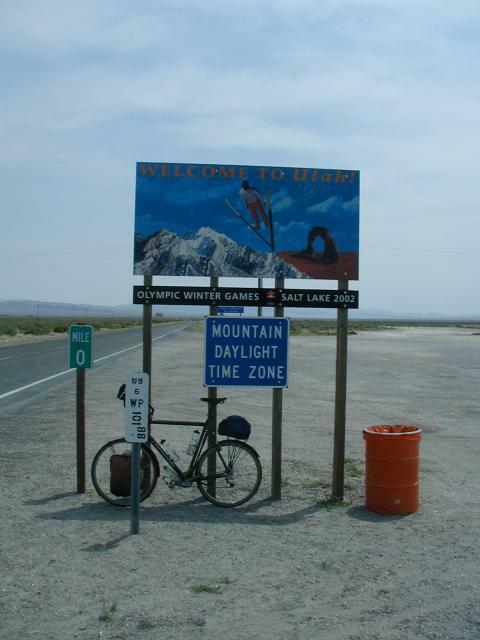 Passed the turnoff to Great Basin Park and was pleased to reach the NV/UT border. With addition of Utah, I've now bicycled in 44 states. Border Motel was in a stark setting surrounded by miles of sagebrush. Off to the west towers Wheeler Peak, over 13000ft and second tallest point in Nevada. No TV or FM radio reception and only limited AM radio reception. A breezy afternoon, but mostly still when I awoke. However, in contrast to Outback Australia, this is still a populated area. For example, Border Inn is on the power grid (vs generators) and occasional ranches are along the way. When having dinner at the bar, another patron bragged of having been stopped speeding @ 146mph. He had his fourth beer and then left on the road. Hopefully not too many of these nuts on the road. My watch was adjusted to mountain time, but still left at 5am to get across the desert before the worst of the heat. It was dark enough I rode in middle of the lane. Car lights could be seen for miles in advance, so easy to be off the road when they passed. Road was flat crossing Ferguson Desert then slowly climbed up into the Confusion Range. Top was at mile 23 and then a good eight mile descent through a canyon and into Tule Valley. Nice rocky open valley with Sawtooth Mountain on other side. A gradual climb and then over Skull Rock Pass at 5237ft at mile 41. Another nice 1000+ ft descent from here into dry Sevier Lake. Light clouds and light tailwinds helped push me along at a quicker pace. Kept up a good pace until the first gas station at Hinckley at mile 83. Glad to have crossed the desert. From Hinckley an easy last six miles and into Delta. With population of nearly 3000, this is a regional center and place to be for 4th of July. Big events seem to be a 10am parade and a 6pm demolition derby. Things started on afternoon of July 3rd with the kiddie parade. Main Street (US 50) was closed to traffic for about three blocks. 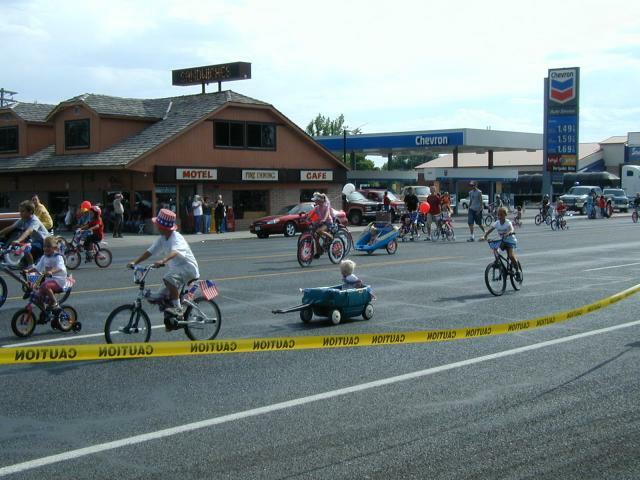 Leading the parade were a few kids racing their bicycles with streamers flying. This was followed by procession of kids in wagons, on bikes with training wheels, on tricycles, one horse, go carts, parents with strollers, etc. Most were decorated with crepe papers, flags and streamers. The street was wide and no real order to it other than every kid going at their own pace. Towards the back were a few parents carrying both a child and a tricycle and finally a police car bringing up the rear. About half an hour later, parade was finished and US 50 back open to traffic. July fourth itself started by booming of cannons a little after six. The motel is next to the one traffic light in town and across the street is the park and center of festivities including morning cannon shots. 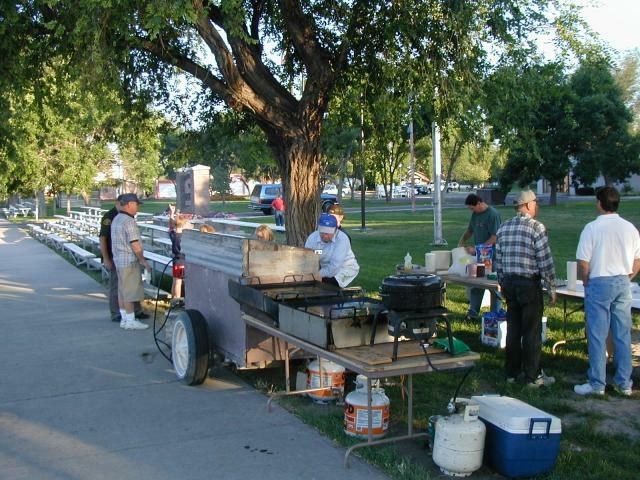 At 7am was pancake breakfast put on by local scout group. The big event was the 10am parade. I find small town parades fun to watch. While they usually all have firetrucks and the junior high band, each is a bit different often with an over-abundance of some type of entrant. For example in Ames, Iowa it was farm equipment, in Chelmsford, Massachusetts it was emergency vehicles and in Bellingham, Washington it was boats. This parade was somewhat balanced, though noticed an overabundance of beauty queens (Miss Delta, Miss Hinkley, Miss Millard County, Miss 4H as well as cheerleaders, drill team, etc), that almost nobody walked and at least 3/4 of entrants were throwing candy for kids to scoop up. Still a fun parade and event for which town streets were lined with spectators. Over an hour with just over 50 entries. After the parade, lunch in the park. A variety of stands, pony rides and other booths. 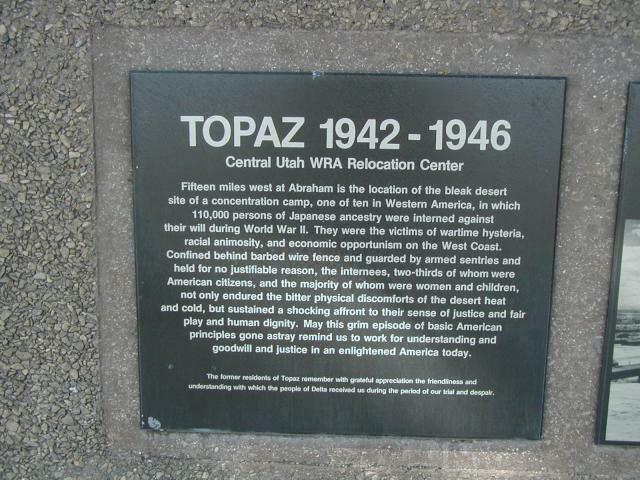 One of the booths was from Topaz museum promoting a 60 year rememberance this August 10th. In the desert 10 miles west of here is one of the sites where Japanese-Americans were interred from 1942 to 1946 during WWII. Looks like a harsh sort of place. Three rounds of about twelve cars to start. Action continued until only three were moving. Most were disabled by crashes, though a few were pushed onto the berms. Boom, crash, hiss, pow, zoom and on it went, gradually until just one or two could drive. 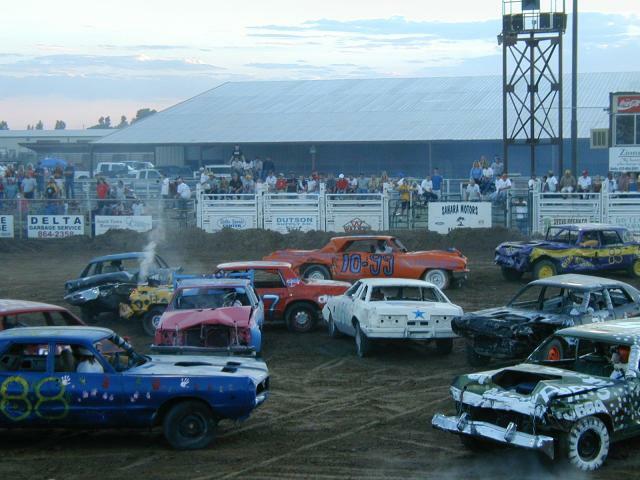 In between, as cars were towed off the field by wreckers or tractors, prizes were thrown to the audience. One fellow decided to do a public marraige proposal to his girlfriend. She said "yes", but seemed more annoyed than pleased at this public event. They raffled off two halves of a pig. T-shirts, BYU hats and frisbees were thrown to the crowd. After three rounds came championship round. Those eight vehicles left moving after the first three. Another round of crashes until just one was left and $950 dollars richer. After the championship round came powderpuff round which turned out to be one of the best rounds yet. It continued with the last two contenders both barely moving and hardly able to crash hard enough to finish the other off. I walked back after powderpuff round as it was starting to get dark, skipping a final "wipeout" round (anything moving again) as well as evening fireworks. 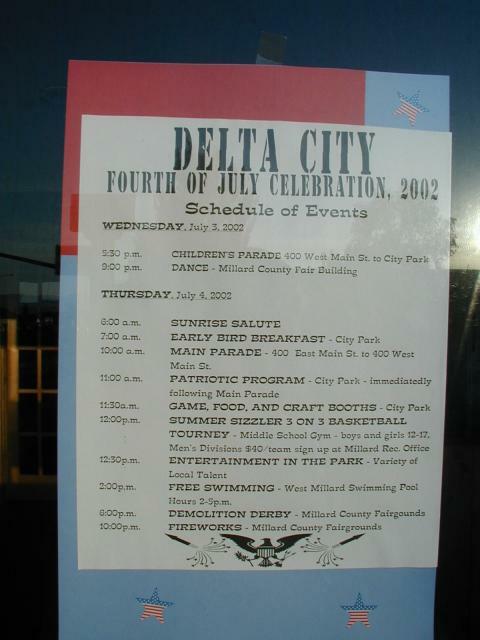 So went 4th of July in Delta. There was a melted crayon in the parking lot. Another hot afternoon as I reached Payson on south side of Utah Lake. Still cool as I left Delta. Rode through town and to split with US 6 as I left US 50 behind. A gradual climb past the golf course and airport before being in wide open spaces again. Doesn't appear to be much agriculture here. A brief stop at 17 miles in Lynndyl where a friendly clerk told me about the "mormon crickets". I hadn't seen any yet, but watch for them. After Lynndyl the road had a gradual climb and also became a rougher chip-seal texture. I also started seeing huge crickets on the road. Many were crushed on the road, attracting others to come eat them. At 32 miles was turnoff to Little Sahara, sand dunes, otherwise little traffic and wide open spaces. 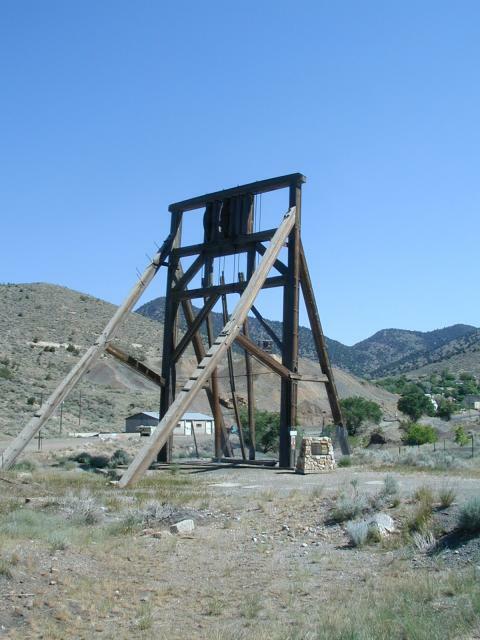 The route went gradually along some hills, passing former mining centers or Silver City, Mammoth and Tintic before turning east and climbing. A gradual climb of two miles brought me to Eureka. The town had seen better times, with many boarded up businesses. I had ridden 52 miles and there was a motel here. However, not much in way of food so decided to continue as it was only 10:30am. Another two miles of gradual climb brought me to top of the hill and Linda's Summit Cafe and brunch stop. Next ten miles of descent surprised me, since earlier climb had been gradual. Here was turnoff to road along west side of Utah Lake. Kept going and made it into Payson as it was getting hot. 77 miles today. Made it to Salt Lake City. Approximately one mile east of the airport, so I'll ride the last mile tomorrow morning. A straightforward urban ride of 60 miles this morning. Left Payson in pre-sunrise cool. First a nice rural route that brought me almost to Utah Lake before veering east towards Springville. Along many large country estates and hobby farms. At 10 miles crossed over I-15 and then west to Springville and a short Burger King break. At this point I picked up 89 and followed it through a succession of towns: Provo, Orem, Lindon, Pleasant Grove and American Fork. A reasonable route that was mostly surburban and along many shopping malls, etc. 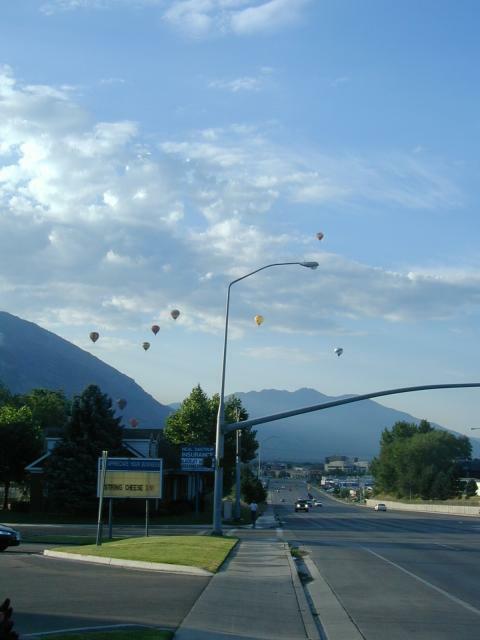 There were hot air balloons over Provo. Saw at least a dozen cyclists out for morning rides. Didn't see any bicycle route/lane type signage along the way though. I did see some buses that could carry bikes. After American Fork, still along 89 for a few miles before following 73 and through Lehi. New subdivisions of home here for those who would commute to bigger cities. At 35 miles turned north onto 68 which I followed almost all the way in. First a brief climb into the Salt Lake City Basin and then through a progression of towns. Near the county line, house numbers started counting down from 17100 and kept all the way to zero at North Temple where I found a Motel 6 nearby and relaxed. Glad to get here early on a day with high temperature of 100 forecast. Overall the route I took into town (68) was a busy suburban road with three lanes of traffic each way. Not particularly scenic, but I'd recommend it as a straightforward way into town. 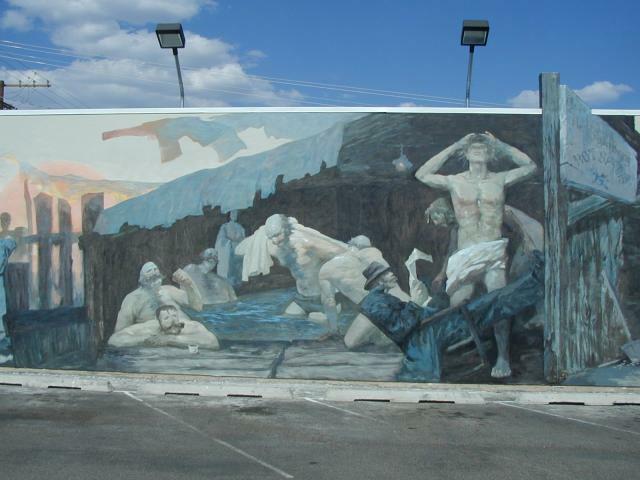 In the afternoon, I walked about two miles to downtown Salt Lake City. Other than walking, most of the was spent at Temple Square, a 35-acre center for the Mormon Church (11 million members). Six day after arriving in 1847, Joseph Smith (or Brigham Young? ), declared this would be a site of a temple. Construction started in 1853 and finished in 1893. 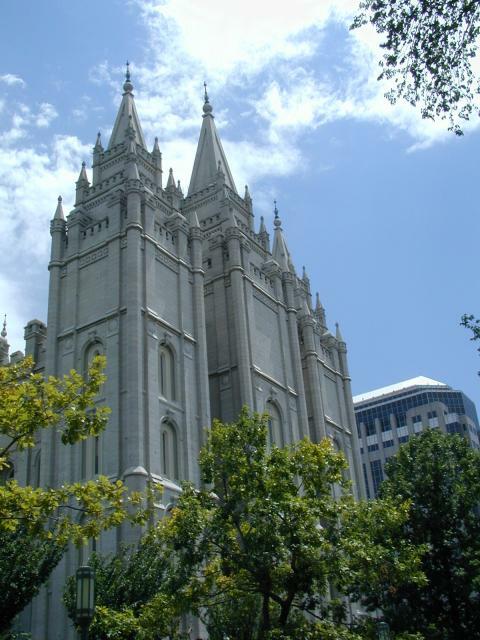 The temple itself is off limits to non Mormons, but there are plenty of other sites including the Mormon Tabernacle, two visitor centers, historic buildings, church offices, etc. I went to organ concert at the Tabernacle building (lovely) and also took a guided tour. Interesting visit. Downtown also had Delta Center with nice old Union Pacific building and other street shops. I could see state capital looming, but didn't go visit. It was a hot afternoon walking back and forth, but fun to sightsee. Alas, good things must come to an end. Slept in and then cycled out to the airport. Got the bicycle packed and had an uneventful flight back to Denver. I was grateful to have my parents pick me up and drop me back in Fort Collins. Overall, I enjoyed the trip and a relaxing time off. Yahoo Group where the journal updates were posted along the way. 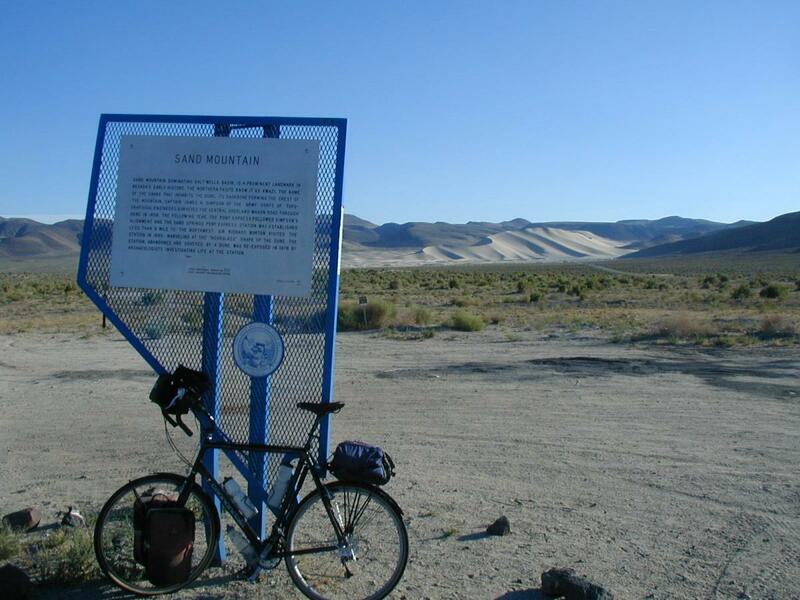 BikeTheWest has an annual ride on this route named OATBRAN for One Awesome Tour Bike Ride Across Nevada. The Route 50 web site description of Nevada.